NETWORK FINALS: The SURVIVOR REUNION special, which didn’t begin until 10:33PM, fell 0.4 in final numbers. In addition, the WILL & GRACE rerun lost 0.1 and PITCH PERFECT gained the same. CABLE HIGHLIGHTS: VH1’s BLACK INK CREW topped Wednesday cable at 0.64, up 0.08 from last week. On History, VIKINGS rose 0.04 to 0.54, and lead-out KNIGHTFALL was up 0.02 to 0.30. Bravo’s REAL HOUSEWIVES OF NEW JERSEY slipped 0.03 to 0.42. TBS’s FULL FRONTAL dropped 0.05 to 0.38. Adult Swim’s TENDER TOUCHES was at 0.38/0.31. On ID, MURDER IN THE HEARTLAND gained 0.07 to 0.36, and UNUSUAL SUSPECTS was up 0.04 to 0.33. ESPN’s COLLEGE FOOTBALL bowl game was at 0.35. 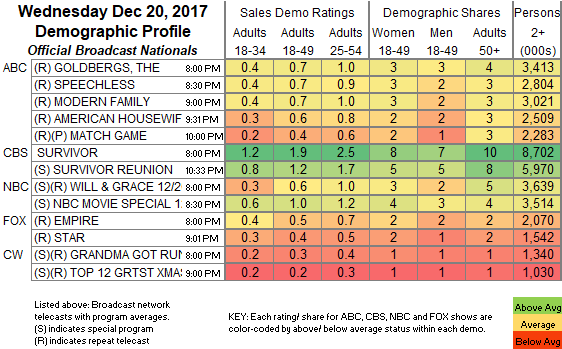 Discovery’s HOMESTEAD RESCUE ticked up to 0.34. On a big night for Republicans, Fox News’s TUCKER CARLSON TONIGHT and MSNBC’s RACHEL MADDOW SHOW tied in the 18-49 demo at 0.33, although Fox was ahead in 25-54s and total viewers, 0.50/3.3M to 0.48/2.6M, while CNN’s CNN TONIGHT was at 0.22/0.29/800K. TNT’s back-to-back THE LIBRARIANS episodes were at 0.32/0.25, compared to last week’s 0.34/0.24. On HGTV, PROPERTY BROTHERS fell 0.06 to 0.31, HOUSE HUNTERS INTL ticked up to 0.26, and HOUSE HUNTERS was steady at 0.26. On MTV, TEEN MOM ran an off-night episode at 0.31, followed by an ARE YOU THE ONE reunion special at 0.26, up a tick from last week’s. On Lifetime, LITTLE WOMEN: ATLANTA ticked up to 0.27, and TERRA’S BIG HOUSE was up 0.03 to 0.21. On Food Network, IRON CHEF: BEHIND THE BATTLE rose 0.07 to 0.26, and IRON CHEF SHOWDOWN was down 0.03 to 0.24. A&E’s STORAGE WARS was at 0.26/0.24, compared to last week’s 0.23/0.19, and OZZY & JACK’S WORLD DETOUR was down 0.04 to 0.21. 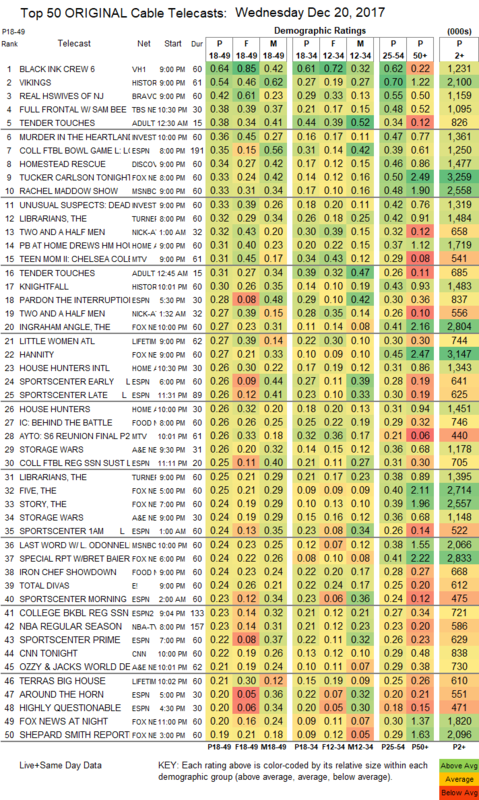 E!’s TOTAL DIVAS edged up 0.02 to 0.24. Syfy’s HAPPY stayed at 0.17. The finale of HBO’s GUNPOWDER was at 0.07.